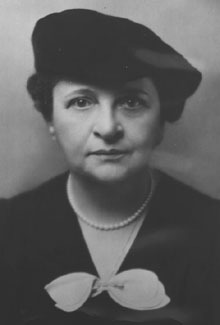 Sociologist and civil and labor rights activist Frances Perkins was raised in a comfortable Republican household, and was one of the few girls at a predominantly boys' high school. She declared herself a Democrat after reading Jacob A. Riis' book about life in the slums of New York, How the Other Half Lives, then taught at underfunded schools, volunteered at settlement houses, and became intimately familiar with working people's problems. She was a frequent speaker at workers' meetings and women's suffrage rallies, after witnessing the horrific fire at the Triangle Shirtwaist Factory on 25 March 1911, which killed 146 workers, almost all of whom were young women. In 1919 she accepted an appointment from New York Governor Alfred E. Smith to become the first and only woman on the state's Industrial Commission. In 1926 she became chairwoman of the Commission, and in 1929 she was appointed by the New York's new Governor, Franklin D. Roosevelt, as State Industrial Commissioner (head of the state's Department of Labor). In this position she made New York the nation's leader in worker's rights, with increased workplace inspections, and her advocacy for minimum wage and unemployment laws. When Roosevelt was elected President in 1932, he asked her to serve as US Secretary of Labor. She initially refused, but after obtaining his promise that he would stand for workers' rights, she accepted, becoming the first woman to serve in a US cabinet post. Perkins held the job for twelve years, and championed so much of the new post-Depression "safety net" for workers she is frequently described as the mother of the New Deal. She proposed public works programs, unemployment and retirement insurance, minimum wage and maximum hour laws, chaired the committee that wrote the first draft of the Social Security Act, helped draft the Federal Emergency Relief Act and the Civilian Conservation Act, and she was among the most outspoken public proponents for the National Labor Relations Act, which recognized workers' right to organize. She was a direct descendant of James Otis, the 18th century advocate-general who refused to argue in support of King George III's Writs of Assistance and instead argued in court for the people against the King. She was also a distant cousin of Civil War hero and Howard University founder Oliver O. Howard.